Zoop is a color-matching puzzle game released by Hookstone. The center grid, containing the ship. The four paths, from the top, left, right and bottom. These are the approaching zoops. The score, at the top left. 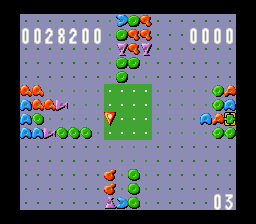 The zoop counter, at the top right (counting down in continuous, or up in level mode). The level, at the bottom right. Purple springs, at the bottom left (not shown in screenshot). A yellow crosshair marker, indicating where the next zoop will appear. To eliminate Zoops, press a button on the controller. This moves the ship forward, clearing any Zoops that match the color of the ship. As soon as it hits a Zoop of the different color, the ship and zoop change colors. In the example screenshot to the right, the ship clears the two red zoops, and then exchanges colors with purple. Clearing a zoop is worth 100 points, increasing by 100 points for each additional zoop you clear in a line. Zoops will gradually appear from the sides, with a random selection. The yellow square marker indicates where the next one will appear. If this pushes a zoop into the center, you will lose the game. A yellow shaped spring. When the ship contacts a zoop, it is eliminated along with up to eight surrounding zoops. A Yellow shaped star. Cleares a line of zoops. A purple shaped spring. When you collect five, the screen is cleared of zoops. A paint splatter. When it contacts a zoop, all other zoops of the same color are cleared on that side of the board. As you progress, the zoops appear more quickly, and the background changes to a new color. The next background is shown in the center, and is meant to make it difficult to align shots. This page was last edited on 25 June 2012, at 05:58.